We all love our gadgets and we love to stay organized! In this tutorial, I'll show you how to transfer your SVGCuts' PDF files to your iPad! Save some trees, stay organized and be more efficient! Let's go! 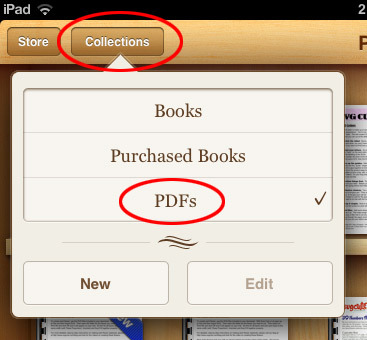 In order to view our PDF files, you'll need to install Apple's iBooks app from the Apple App store. It's free and only takes a few seconds! 1. Open the App Store application on your iPad. 3. 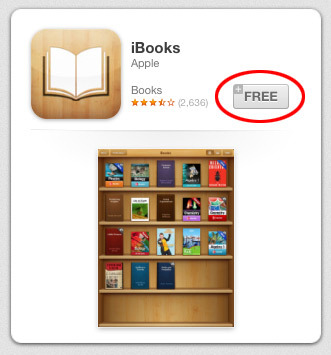 Install the iBooks app by clicking the Free button. You may be asked to provide your Apple ID and Password in order to install iBooks. 4. Congratulations, you are half way there! Now that you have iBooks installed, you can begin transferring your PDF files over! 3. 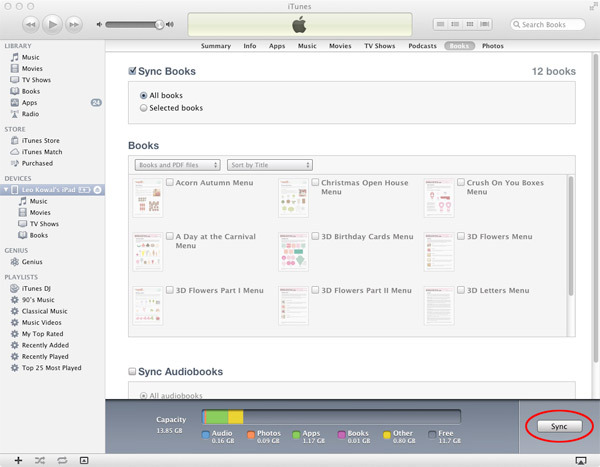 Click the Books option at the top of the screen and then click Sync Books. 5. Locate the PDF file that want to transfer to your iPad, highlight it and click Open. Repeat steps 4 and 5 to add additional PDF files. 6. 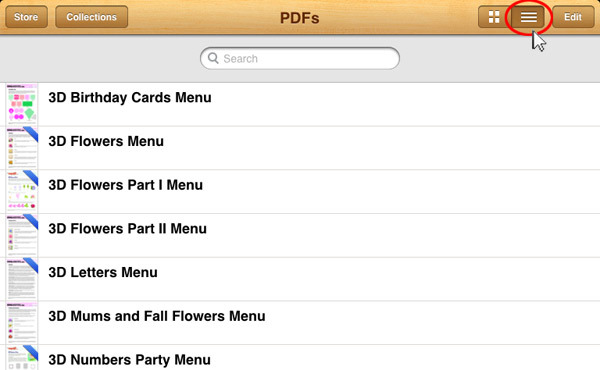 Once you've added the PDF files, click the Sync button to transfer them to your iPad. 7. You've successfully transferred the PDF files to your iPad. Open the iBooks app from your iPad. 8. Click on the Collections option and select PDFs from the drop-down menu. 9. Congratulations! You did it! 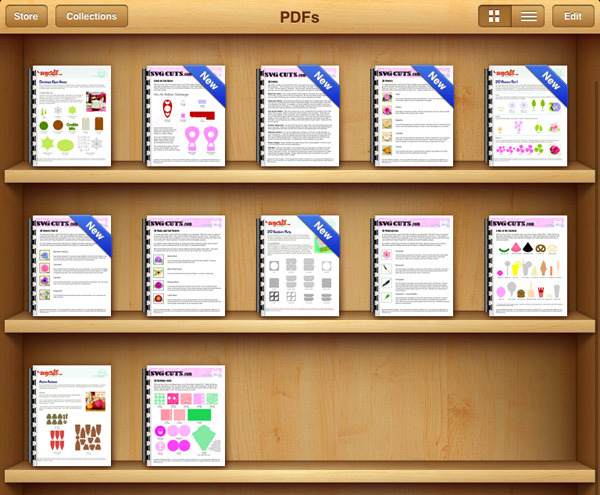 You can now click the PDF files to view them on your iPad! 10. Bonus! You can view your PDFs in alphabetical order by click on the list option located on the top right corner. Get out of town!!! Now I really wish I had an Ipad. :( This is awesome! Hugs! Hi Leo…..anything for Android???? Would live to be able to do this. Not yet! When we get our hands on an Android Tablet, we’ll be sure to do a tutorial! Thanks, Leo! I hadn’t thought of doing this! I have all my Cricut carts on my iPad, so this won’t be any more difficult to do this! So the purpose of this is to keep track of your images???? Woot! So excited to do this! Will be so much easier for me! Would this work on a HD Nook or iPhone? iPhone yes, a process similar might work for the Nook, but this tutorial is of iOS devices only. No you cannot cut to the Cricut with your iPad. This tutorial is just to show you how to transfer and view our PDF files. Very cool. Would love to do this on my new tablet I just received for my birthday. I’ll be waiting for that Android tutorial! Good thing I bought myself an iPad for Christmas. ;o) This is a wonderful idea!!! I will be doing this very soon. Thanks! Not only did I do this but I created a category called SVG CUTS and put them all under there and they are separated from my other PDF’s!!! Awesome Idea!!! I have been wanting to do this for a while, so i can get rid of my folders of papers but also it is easier to assemble projects when im not scrolling between screens when cutting. also, so I can remember what I have and have not yet purchased :) thanks Leo and Mary for taking such good care of your customers, it makes a huge difference when we are choosing where to spend our money. You can send the pdf’s to your kindle as well. I am an ipad user but have also found a way to send the pdf’s to my kindle or kindle app (for android users). 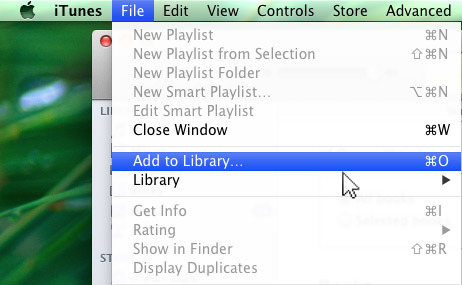 I just tried this today and it doesn’t work like this anymore :-( Apparently, it’s an all new iTunes (11.0.4.4). I can find the Devices under the File menu, but every option (like synch, backup, etc is greyed out/unavailable. 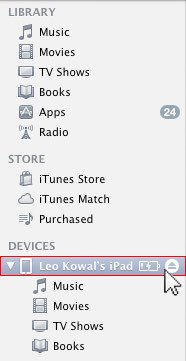 I do have my PC with iTunes plugged in to my iPad. Any suggestions? Am I doing something wrong? Would love to make this work!! Oh, gosh! Sorry! Apparently I had to restart iTunes to after plugging in. I’m synching now and will try the procedure. Please don’t publish my question! Sorry!!! Is it possible to download it directly to my iPad instead of having to go through the above mentioned process? I do have iBooks on my iPad and have downloaded other PDF’s directly to it. Just transferred more pdf’s to my IPad from my PC and was worried that it would bug because of the new IOS update…but it worked just fine! So happy to have these pdf’s on my IPad.